Click image to enlarge Blalock Islands, from Washington State Highway 14. Image taken May 24, 2005. The Blalock Islands are a cluster of islands located between Boardman and Irrigon, Oregon and across from Canoe Ridge, Washington. 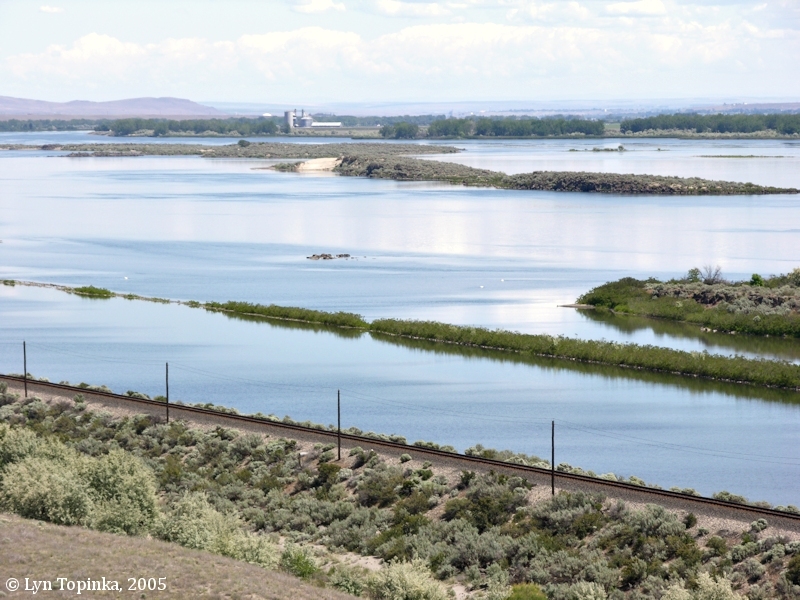 Their downstream end begins at approximately Columbia River Mile (RM) 274 and the upstream end around RM 276. Originally Blalock Island was a large island, often split into two islands, until the area was inundated by Lake Umatilla, the reservoir behind the John Day Dam, leaving only the high ground behind as smaller islands. Today the Blalock Islands are a part of the Umatilla National Wildlife Refuge. "Big Blalock Island" is 0.8 miles long and is the upstream-most of the islands. It is located 2 miles southwest of Paterson, Washington. The U.S. Board of Geographic Names made "Big Blalock Island" the official name in 1983. "Little Blalock Island" is 0.7 miles long and located 0.3 miles west of Big Blalock Island and 0.8 miles north of Sand Island. The U.S. Board of Geographic Names made "Little Blalock Island" the official name in 1983. "Sand Island" is 0.2 miles long and is located 0.8 miles south of Little Blalock Island and 2 miles west-southwest of Big Blalock Island. This island is the downstream-most of the islands. The U.S. Board of Geographic Names made "Sand Island" the official name in 1983. "Rock Island" is 1/4 miles long and is located 0.3 miles southeast of Little Blalock Island and 0.2 miles southwest of Big Blalock Island. This webauthor could not find this island listed on "Topozone.com"'s map (2007). The U.S. Board of Geographic Names made "Rock Island" the official name in 1983. "Telegraph Island" is another island in the area located north of Little Blalock and Big Blalock Islands, and was not a part of the original Blalock Island. It appears as an unnamed island on the 1906 "Block Island" topographic map. The U.S. Board of Geographic Names made "Telegraph Island" the official name in 1966. Previous variations on the name were "Telephone Island". 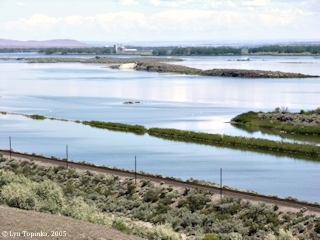 "Long Walk Island" is on the Oregon side of the Columbia River located between RM 274 and 275. 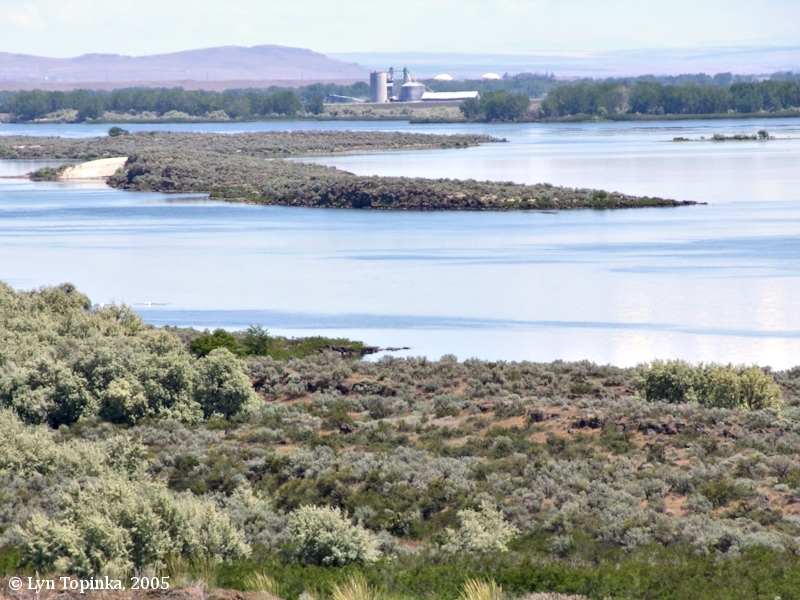 It too was not part of the original Blalock Island and was instead part of the Oregon shoreline during pre-reservoir days. The island is 2.2 miles long and is approximately 1/2 mile southeast of Big Blalock Island. The U.S. Board of Geographic Names made "Long Walk Island" the official name in 1983. "Coyote Island" was an island just south of the original Blalock Island, and was located just off the Oregon shore slightly upstream of the old Oregon town of Coyote. Coyote Island is now under the waters of Lake Umatilla. In 1831 John Work of the Hudson's Bay Company called the main island "Big Island". Later fur traders called it "Long Island". The 1858 map "Map of military reconnaissance from Fort Dalles, Oregon, via Fort Wallah-Wallah, to Fort Taylor, Washington Territory, 1858. " has the island labeled "Long Island". The 1906 USGS Topo 1:125,000 "Blalock Island" has the island labeled "Blalock Island". 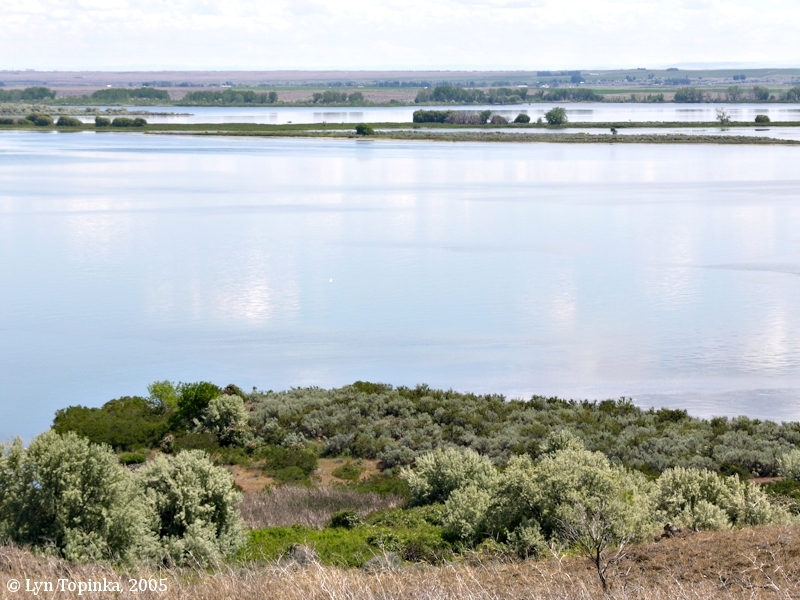 Today the original large "Blalock Island" is under the waters of Lake Umatilla, the reservoir behind the John Day Dam, and only small islands dotting the Columbia are left. These islands are now known as "Blalock Islands". In 1983 the U.S. Board of Geographic Names made official the names of the smaller islands - "Big Blalock Island", "Little Blalock Island", "Sand Island", and "Rock Island". Click image to enlarge Blalock Islands toward Grain Elevator. Grain elevator is downstream of Irrigon, Oregon. Image taken May 24, 2005.